Muhammad Ali left us today, in as far as he ever can. 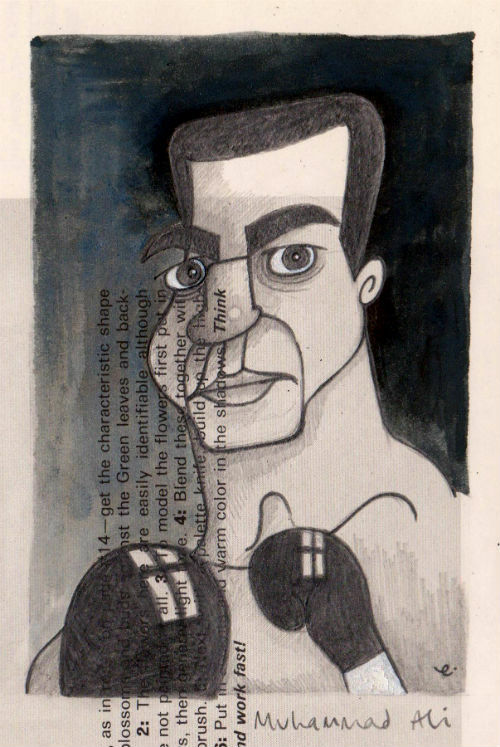 Cassius Marcellus Clay Jr. was just a boxer. A boxer in the same way, perhaps, that Pelé was just a footballer, but just a boxer all the same. Muhammad Ali, however, was a politician, a poet, a wit, a diplomat, a contrarian, a storyteller, a peace campaigner, a husband, a father, a religious advocate, a motivational speaker, a pillar of the civil rights movement, a television personality, a social theorist, a comedian, a villain, a hero, a martyr. He was also twice the heavyweight boxing champion of the world. Having been stripped of the title for his social and political ideals in the turbulence of 1960s America, he regained it - aged 32 - against George Foreman in Zaire with such a breathtakingly audacious combination of brawn and brains that it walked the unseen line that divides life and death. Just under a year later, he retained the belt fighting Joe Frazier in the Philippines. Flirting with that line again, The Thrilla In Manila was a contest of such punishing circumstances that everyone involved was pushed to the outer limits of the known human capacity for endurance: physical, emotional, spiritual. In the end, Muhammad Ali was a leader. Never before or since has a sporting figure so supervened their station and entered the wider public consciousness with such vitality or luminous brilliance. Ali is a hero to more than just those who follow boxing or saw him fight. Some, I'm sure, don't even know he was a fighter. After a time, it became incidental anyway. Muhammad Ali went beyond labels, beyond time and place. Muhammad Ali gave people hopes and dreams; his foibles, mistakes and indiscretions serving only to make us feel better about those of our own. To come across Ali's story is to be moved, thrilled, excited. It is energising in a way that speaks to the human spirit at a most fundamental level. His story will be discussed for as long as human beings are. The words "The Greatest" will never be far away, drawn magnetically towards one another. It was Clay - the boxer - who first immodestly bestowed himself with the moniker. In later years, Ali would admit he had done so without even realising yet that he was. Nevertheless, it was prescient in the extreme: Ali's life continued along a path of transcendence as if, at times, guided by an unseen hand. Those of us today, living on in his wake, are blessed and cursed. Cursed because we are too close to properly appreciate Muhammad Ali with anything like the true perspective that his life, his achievements, his personality, his essence, will ultimately demand. It may take tens, or hundreds, of years for that to be possible. But we are blessed, too: no-one else in human history will be able to boast that they had shared a planet with him, had the opportunity to see their lives directly impacted or influenced by his in real time. Muhammad Ali was bigger than boxing, bigger than sport. His was the ineffable spark of humanity. This was as good as it gets. He is the greatest.